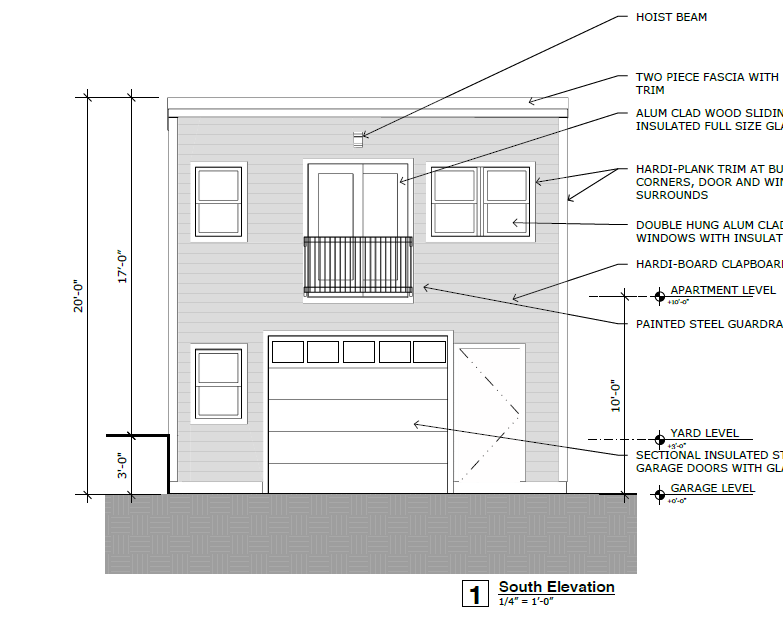 Case 1: 1719 C St SE, for a special exception to use the second story of a new two-story garage as an apartment. This is one part of the zoning code I simply do not understand. If you have a two-story garage that was built in 2013 or earlier, you can use it as an apartment. If you build a new garage, you can use it as an apartment only after five years. What? But if you build a garage now and want to use the second story as an apartment, you need a zoning exception? Anyway, the applicants want to build a garage and use the second floor here as an apartment. It’s a giant lot (3400 feet), it’s a huge square, the alley is wide, they ensured a home for their trash cans not in public space. These are the kinds of buildings we want, not for the applicant to seek a second unit by building down or adding up or pushing back. Everyone wins here. The committee unanimously supported this application and put it on the consent agenda. This building is by right. The use requires a special exception. But if the apartment were in the basement of added to the rear or added to the top of the primary building then that we’re good? This was a straight forward case about adding a non-visible rear addition to a small wood framed building. Case 3: Capitol Hill Arts Workshop Resolution of Support for dispposition and a 20-year ground and property lease of the B.B. French School. There are always some cases where a hearing seems perfunctory but we appreciate CHAW coming to give us an update. This bill will give CHAW the ability to acquire financing for necessary capital improvements and to stay a pillar in our community for another 20 yeas. This hearing was continued at last month’s HPRB hearing. HPRB generally approved the design but requested changes and the case come back before HPRB. ANC 6B took the opportunity to also look at those changes. 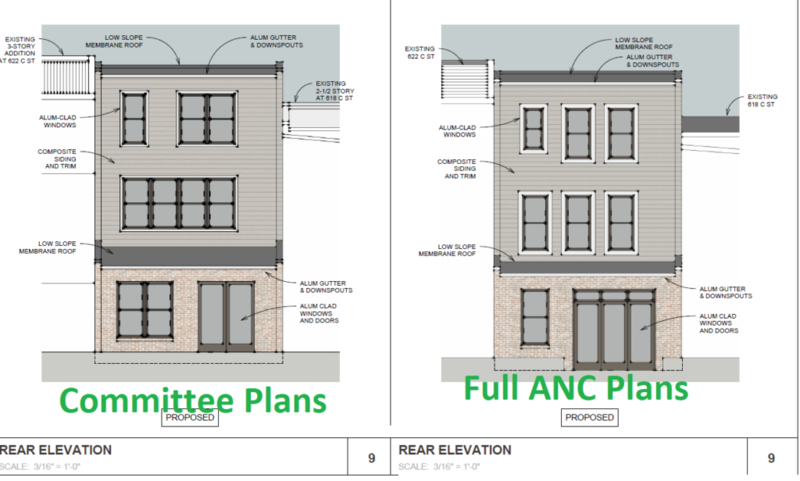 At the full ANC, the applicant presented updated rear elevations along with more renderings and perspectives of the concept. 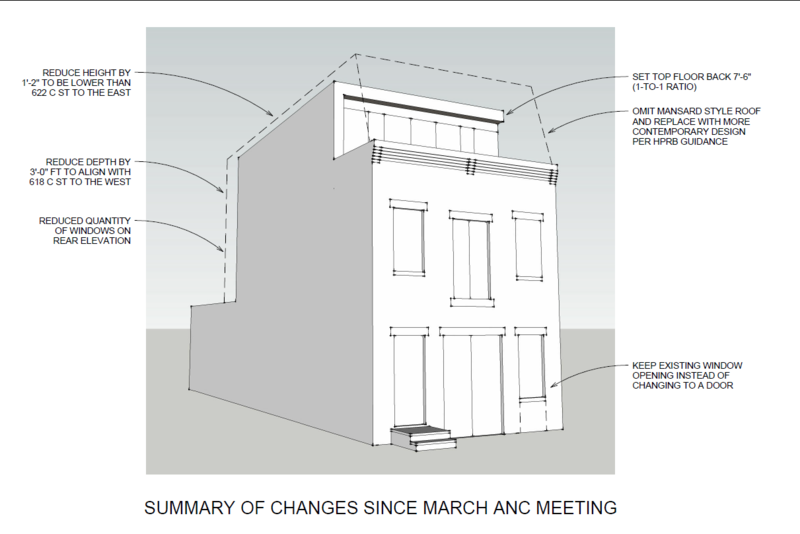 The changes to the rear elevation are more in line with standard rowhouse rear elevations and, in my opinion, present no compatibility issues. With little time for in depth discussion, the changes to the first floor and second floor were unanimously approved by the ANC. Long time readers will recall I supported last month’s design for a mansard addition on the third floor. I thought it narrowly threaded the preservation regulations and should have been approved. Given that, it should be no surprise I also supported the more modern minimally visible third floor addition here, including the rear elevation. For much the same reasons, this is a commercial building on a transitional block that retains only portions of it’s original state. The ANC first voted to oppose the third floor, a motion that failed 2-4-3. I amended a second motion to support the third floor a that passed 4-2-3. The committee discussed this cast last month as well without taking a formal position. In the end, we unanimously and vehemently opposed the concept of running the circulator down the 700 block of D and 400 block of 7th. Also I anger tweeted this about the real problem with the design. 1) District Soul Food Liquor License Renewal. The ANC moved to delay considering of this case for a month but also issue a formal notice to cure. I’m sure one of our two local newspapers will cover this story, but I could not vote to support this action because we are clearly singling out a new business rather than working with them during the renewal process. If we were two years from renewal and they had been operating this way for an extended period, sure, let’s go wild. But this is a new business in a struggling retail corridor that needs our support. I abstained from the vote because I liked the idea of delaying considering for a month while working with the applicant, but a formal notice during renewal is just unnecessary. 2) 7th Hill/Montmarte and Lavagna Liquor License Renewal Both applicants failed to appear given two opportunities so the ANC moved to formally protest the license. It’s frustrating but since ABRA functionally consolidated all opposition opportunity to the ANC and the ANC only, we need to take no shows seriously. I voted with the majority to formally protest the liquor licenses. 3) Resolution of regarding use of taxpayer dollars for sexual harassment settlements. And with that, I’m on vacation and will be back to ANC duties in a couple of weeks. This entry was posted in Meeting Reports and tagged bike lanes, historic preservation, liquor licenses, zoning on April 10, 2019 by corey.